The last of my Sinful untried's! All of these are shown using two coats and the application and coverage was great, other than on Soul Mate. That one, the only creme in this group, was extremely thick, even after adding thinner. Above: Mercury Rising (love the name!) is a deep red, not quite burgundy, with slight brown under-tones. It has beautiful 'glowing' shimmer. Below: What's Your Name has a glossy black base with blue-green glitter. 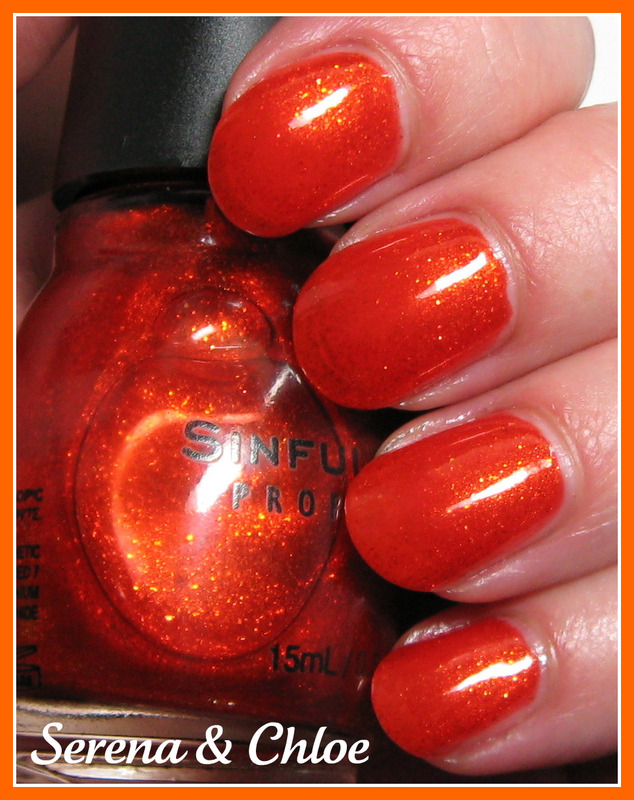 Below: Serena & Chloe is a juicy orange with glass-flecked glitter. I was surprised how well this covered in 2 coats. 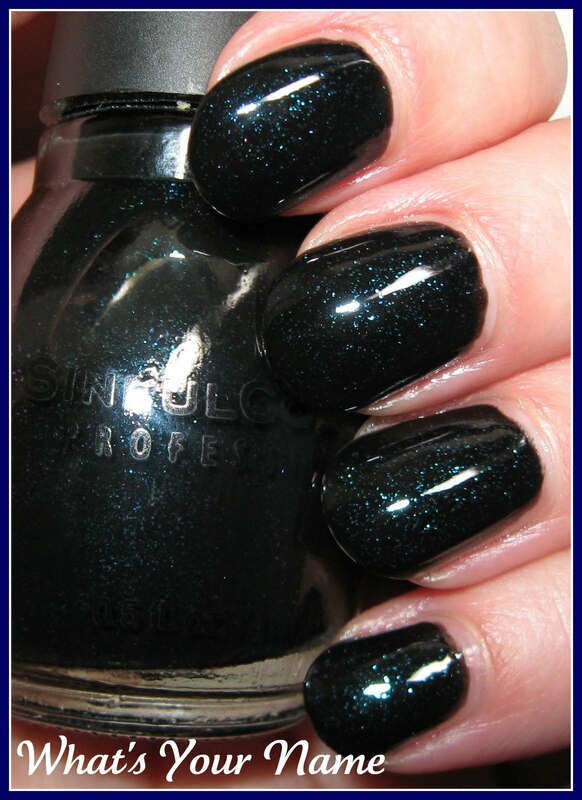 Below: Serena & Chloe also doubles as an excellent layering polish (shown over What's Your Name). Does this look Halloween-ish?!! Below: Let's Talk--about how gorgeous and vivid this shade really is, but because it's a purple, the camera didn't capture all of it's beauty. This is a bright royal purple micro-shimmer and I'm disappointed I wasn't able to get an accurate photo of it. Below: Soul Mate was really a mess as far as the application went. I had to work with the formula quite a bit, and it's still too thick. But I love the shade--a mid-tone pink with hints of coral. This completes all of the Sinful's I've been accumulating over the past couple of months--I think! 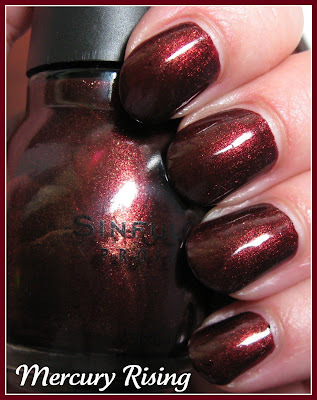 I've said it before, and I'll say it again, Sinful has really improved their formula in the past year or two. The coverage on these (we'll leave Soul Mate out of this discussion) was excellent, and the shade selection they offer just gets better and better. Did anyone else have problems with Soul Mate? I'm going to keep adding thinner and see if I can get it right, because I love the shade. Let's talk looks fantastic. When I was at Walgreens the other day they had Sinful nail polish taking over 2 rows of shelves in the seasonal aisle, with lots of colors. It looked like they were really promoting them. They're gorgeous ! I don't really like Serena & Chloe as I'm not an orange person at all, but layered over black, it turns really great ! I love the What's Your Name and Serene & Chloe layered over that. I've also got Let's Talk, and let me say, my camera is EVIL! EVIL, I tell you! 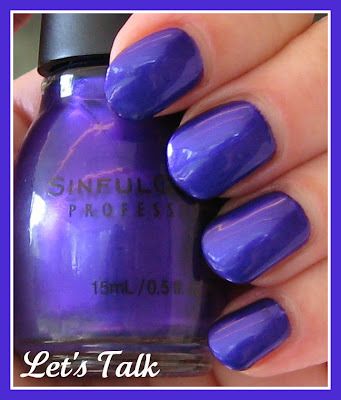 It loves to capture Let's Talk as a bright blue/blurple instead of a cool purple. Soul Mate's a great safe color, but I've had a few issues with application (not with coverage though). 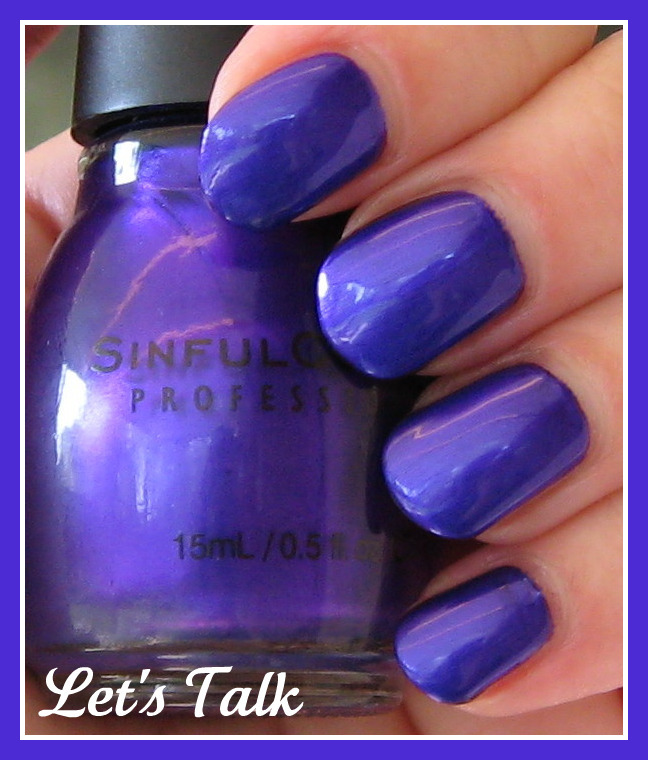 I haven't met a Sinful Colors polish I didn't like, but Let's Talk is the bomb! They're all beautiful shades. I have to check my list to see which ones I have. My girlfriend just picked up Soul Mate for me. I really hope I have Serena & Chole. That's a gorgeous jelly! I just swatched Soul Mate and I had the same issues! I really like the color though. I also had a really hard time capturing the purple of Let's Talk. Every picture made if look blue. So frustrating! But great swatches either way! Tiana~it is soooooo much prettier in real life! Almost an 'electric' purple. SilhouetteScreams~I wasn't sure how it would turn out, but it is really pretty. Such a glowy orange over a darker shade. 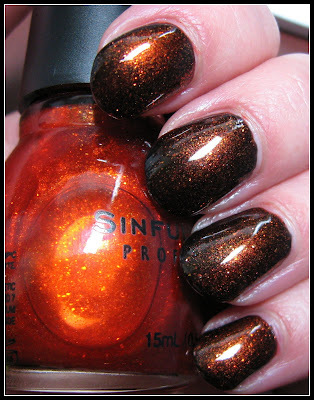 Cali369~Soul Mate is a pretty shade, just a bad formula. I agree though, the others are gorgeous! DistantDreamer~that's a good idea. I tried so hard (I took tons of pics of this one) to capture it, and I just couldn't. Phyrra~I know, they're coming out with so many shades, I'm afraid I'll end up with dupes, as they seem to have some of the colors in several different displays. Silver Diva~I love that one layered too, I'll have to try it over a few other shades. Too bad about Soul Mate being so problematic, because I love the shade. Lacquer Ware For Tips And Toes~that is such a gorgeous shade of purple. I love the finish on it! cupper82~interesting that we all had problems with that one! I do like the shade though, but really, how much thinner do I have to add?!! Lissi~Purples are so hard to capture. Even when I take it outside, I have problems! I have soulmate! one of my favorite colors.. ! really pops on my skin... a pastel coral, yet I HATE it as well.. goopy, i have never had a polish so pasty/thick.! ?.but it looks great when it's done.